Has Running in London Caused me to Develop Asthma? Over the past 18 months I have developed exercise-induced asthma. Are there others who have developed this condition since running regularly around London or other cities? It took me a long time to recognise my symptoms, so I wanted to share my experience and ask if others have had similar experiences. April 2014. I was running along Embankment with Run Dem Crew Elites. I’d been speedy as ever over the first ten minutes of our run but along our favourite stretch for suicide pace I just couldn’t seem to move as fast as usual. I was wheezing, and it felt like I was running through toffee. I’d had an emotional day and put it down to that, not expecting to give it another thought. Then, in October 2014 I was leading the Elites on a run to Hackney Empire. I was comfortably fast over the first mile and a bit, but as we hared down Broadway Market into London Fields I had to slip back and eventually I was forced to stop. It was the same thing. Wheezing, and it didn’t seem to matter how much I breathed in, there wasn’t enough air. The Elites waited for me and I trailed in at the back, stopping at regular intervals. Ian gently suggested it could be exercise induced asthma. He’d gone through a similar period of struggling with paces and distances he knew he could normally handle. That night Housekeeping had been rammed. It had been really hot in the building, but when we eventually got out the air was cold. Ian suffered from asthma generally, but found the cold air could be a trigger. He was able to get back on top of things once he’d realised what was going on, and hoped it would be the same for me. I was grateful for Ian’s help but wasn’t over the moon at the idea I might be suffering from asthma. I was worried this might stop me doing what I love. I didn’t have any similar experiences for a while so again decided it must have been one of those days. Fast forward to March of this year. I was running with Elites for the first time in a while. I wanted to get one final speedy blast in before I started tapering for Paris Marathon. I felt great as we sped over the first mile, but early in the second mile my lungs slammed the brakes down hard. I was wheezing badly, my maximum speed dropped hugely and I began to get a headache which lasted for some time. The Cheetah Elites were at City Hall so I let the Elites know I would drop down and struggled back in. I was able to run Paris Marathon without any problems, getting a Boston Qualifier. But I knew something wasn’t right and began exploring this with my doctor. As a former smoker, they had to run some tests to make sure this was not lung cancer; I was relieved when I got the all clear. Eventually I was diagnosed as probably having asthma and prescribed two inhalers- a brown one which contains a steroid and is a preventative; and a blue one which I’m supposed to take out with me when I run. The doc suggested I could have had a mild form of asthma all my life, which I’ve been able to manage independently up until now. I was really interested to learn from this great Sky Sports video that 25% of all professional athletes suffer from asthma, compared to 10% of the general population. It’s most prevalent among skiers, then it’s cyclists and third is distance runners. It seems the extra work we’re asking our lungs to do means we’re also exposed to more of the things that can trigger asthma attacks. Athletes like Mo Farah, Paula Radcliffe and David Beckham have all reached the pinnacle of their sport with asthma, so it need not be a barrier. It’s also quite possible that the volume of running that I do has led me to develop asthma, and it may not be related in any way to pollution in the city. However, since March and before I got the brown inhaler, the attacks came much more regularly. I noticed that if I ran by the River Lea, away from traffic, they didn’t happen, but if I ran any of my normal routes, through London’s traffic-laden streets, I was at risk. When I ran Paris Marathon the streets were closed to traffic; no problems. And this got me thinking: has running in the city caused me to have asthma? There’s no way of knowing for sure, but it’s pretty clear that pollution can be a trigger for me. With that in mind, a philosophical question occurred. Is it right for me to run in the city, and even with Run Dem Crew, if it could be making me sick? 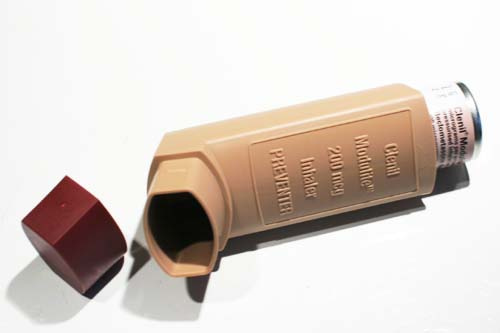 Does a brown inhaler just mask a problem? Am I damaging myself further by running? I can’t answer these questions. But I do know that running and Run Dem Crew have been such positive forces in my life that I’m damned if I’m giving them up without a fight. The problem is, living in London, it is going to be difficult for me to get the training in that is needed to run fast times in marathons without exposing myself to pollution. I can head out of the city on weekends, but the sheer volume of miles necessary make it nigh on impossible for me to get out in the week when I’m working. This has got me thinking about the levels of pollution in our city in general. When some cyclists in London wear masks, and even pedestrians in Tokyo, it’s clear that even if we’re not suffering from asthma, we’re exposing ourselves to toxic air when we run. Oxford Street is the most polluted street in Europe and London pollution levels are illegally high. I’m not trying to scare anyone, but I feel a responsibility to raise these questions with my fellow runners. We know the physical and psychological benefits of running. Perhaps we also need to reassess the risks. It took me a year to realise these were not isolated bad runs, so I wanted to share my experience. If you’ve ever had similar symptoms, it does no harm to get checked out by a doctor. Without a doubt, the brown inhaler is enabling me to run regularly in London again. The question is, should I? I had a similar experience although I have the luxury of running through woods close to where I live so traffic pollution was easy to rule out. After going through basic tests and receiving the brown inhaler I suffered more attacks than I did before. I’m no super speedy athlete so to go from slow runner to gasping, wheezing, hardly able to lift my legs runner I went back for a blood test to see if something else was wrong. A phone call the following day from the blood lab to tell me I’m very anaemic and needed to see the doctors for help with this was worrying as well as interesting. After treating the anaemia I have eventually recovered enough to no longer need the inhaler – this took nearly 6 months!!. I still see the asthma specialist at my doctors and they reckon my lungs where over taxing themselves to deal with the lack of haemoglobin causing inflammation which is very similar to asthma. Ah, sorry to hear about that. Glad you’re better now. It seems diagnosis is often via a process of elimination so it can take a while to get to the root causes. Don’t know if it’s worth mentioning, me & PB went to a talk from a respiratory physio (and sub 2:45 marathon runner). One of the things he advocated was a Powerbreathe (I have a cheaper copy of one at home). I thought I would show you this http://www.powerbreathe.com/blog/25-of-team-gb-suffers-from-exercise-induced-asthma in case you were interested in non drug options. Haven’t read the full case study, but thought it may be of some interest to you. Interesting information and thank you for sharing. Thank you for following BrewNSpew. It’s interesting that this post gets regular traffic every week without any plugging on my behalf, Eugenia. I suspect others are in the same boat. What are your qualifications, Richard?